This year I was lucky enough to go down to Indianapolis and attend my very first Gen-Con. For those who are unaware, Gen-Con is the largest tabletop gaming convention in North America. Boasting over 60,000 unique attendees over the span of 4 days. Over those 4 days I was able to meet professions in the industry, learn a lot about tabletop game design, and even try out a number of new games. 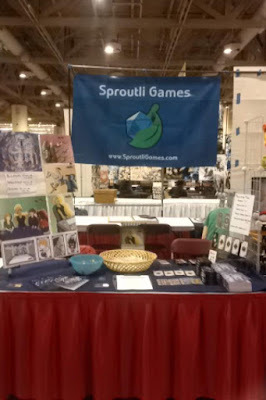 Along with attending the con, I was also working at the Third Eye Games booth, selling a number of RPGs. While at this booth, I was able to get to know the founder of Third Eye Games, Eloy Lasanta. Who I would like to say is a very nice and friendly guy. Who was willing to give me advice about game design, and even invited me to attend the Ennies, an award ceremony for tabletop games. At which I was introduced to a number of big names within the industry. The event was a blast, and it was the first time I have ever really felt like I was part of the industry. During the rest of the con however, I was able to play games via the con’s Game on Demand service. This allowed me to hop in and try games that I have been interested in, and wouldn’t be able to my normal gaming group. The first of which was a game called Ryuutama, a Japanese roleplaying game focused around light hearted travel. This has been on my radar for a long time and I had such a great time playing it. The unique mechanics, and overall feel of the game got me hooked. I enjoyed it so much in fact, I bought it during the con. The other new game I got the chance to play was Inspectres, which is an interesting RPG which has group playing stars in a ghost busting reality show. The premise and mechanics were interesting, and it gave me some great ideas on how I can improve Consortia, but overall it wasn’t my cup of tea. With the shear amount that I saw and learned at Gen-Con, I would be a fool not to go next year. But this post is only the beginning of my Gen-con retrospective. Over the next few weeks I will be releasing a series of blog post which go in depth with what I learned at the con. With the end of July fast approaching I figured it was time to post another developer update, in order to keep everyone up to date on the progress of Trials of the Magi. The first bit of news I have to share is that designs for the entropy deck are complete can be seen in the image below. For these cards we chose to go with a much simpler design when compared to the Arcana Cards. The reason for this is that within the game, Entropy Cards are flipped over off the top of the deck and left face up on the table. Because of this players need to clearly understand what the face of the card is [Order or Chaos] no matter the angle they are viewing the card, leading us to choose a strong color theme for each card. But color alone is not enough, so in order to accommodate colorblind players, we also assigned a symbol to each card type. 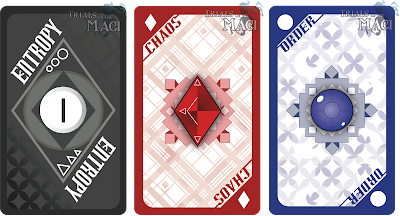 Now that these are done, all of the card designs are complete for both decks. All that is left to do on the card side before printing is the design of the fold boxes that the cards will come in. The interior text of the book is also complete and is currently going through a revision and editing period, with sights on having it finalized by early august. Also in regard to the interior of the book is the progress on both the interior art. Regular meet-ups with the books main artist, Kayleigh Allen has allowed us to get a majority of the books pieces complete. As a little sneak peak I have posted some below. The only other Items remaining before print is the books cover art and interior layout, which are both currently being worked on and should be complete by mid-August. Everything seems to progressing forward successfully, and I am so excited to deliver a finished game to everyone who wants to play it! Through the number of tabletop role-playing games I have played and designed over the years I have seen a trend emerge. Almost every game I have seen has had a strong focus on keeping all of the possible characters in the system, balanced. They always try to set it up with the mentality that a mage should be just as strong as a rouge or fighter of the same level, and in most other situations that would be the best way to go about it. But tabletop RPGs are a flexible and versatile medium, making pure mechanical balance not enough to make players feel equal. I am getting ahead of myself a little bit, so lets take a step back and look at why balance is important in games. Traditionally, balance is implemented so that each player has equal opportunity to win, given that player skill is also equal. When applying this to TRPGs I have one major concern, victory isn’t the driving force of the medium. There are so many more facets to an RPG than just winning. 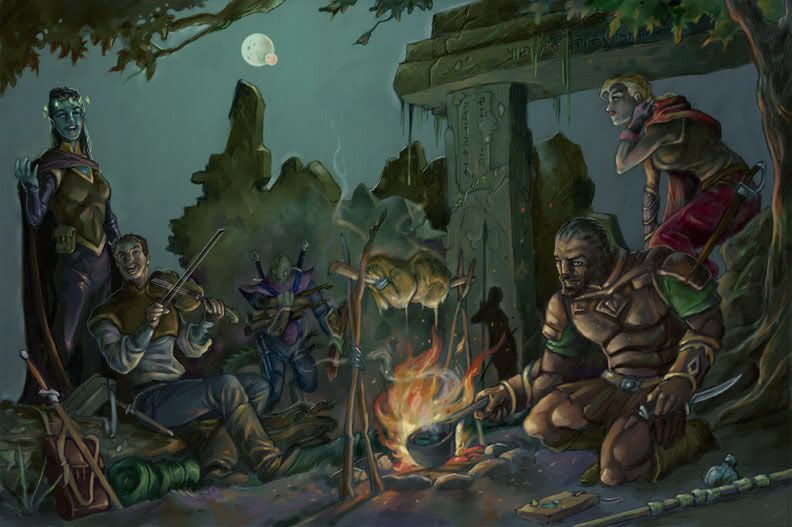 Some people play to get lost in a fictional world, others want to take part in a deep story or lore, there are even those who simply play for the joy of roleplaying itself. All of these aspects don’t have a clear victory statement and in most situations don’t require balance. That being said, I still think a form of balance between players is required. But I believe that this required balance should be between each player’s ability to influence a session, opposed to purely mechanical balance. This "Opportunity Balance" as I like to call it, aims to ensure that all the players feel like they have impact on the events that transpire within the game, regardless of character strength or level. The ability to act makes each character feel as though they are important to the game allowing them to stay invested. While character balance can help promote Opportunity Balance, by ensuring players have the same chance to succeed actions, it isn’t the only influencing factor. As pretty much anything from in character knowledge to encounter setting can impact Opportunity Balance. As a Game Master, it is important try and have each player take the spot light at least once per session. Getting that time to be the hero/center of attention is one of the many reasons it feels good to be on a team. In some cases it might be a good idea to modify your sessions on the fly to ensure Opportunity Balance occurs. As an example of this lets look at a session where everyone but the rogue has had some important role this session. The bard swindled his way into trading some lesser jewels for a treasure map, the wizard was able deactivate the dungeons magic seal and gain entry, even the fighter tore through the creatures that litter the caves. Having not really done anything important the person playing the rogue is left bored and disinterred in the game. Noticing this the GM is able to add a grand chest to the dungeons treasure room. A chest made of engraved steel that is far too heavy to move. The problem is this chest is locked, and the rogue is by far the best lock picker in the group. To make it even more impactful, the GM can model the chest with multiple locks and make a big endeavor of opening it. This simple act puts the rogue player front and center. Everyone rooting him on as he helps reach this great treasure. This spotlight allows the rogue player to feel like an important and valued member of the team. This is by no means the only way you can improve Opportunity Balance, and I am interested to hear how Opportunity Balance has effected your games? Let me know by commenting on this post or shooting me a tweet @MTTJ_Patrick. I would like to start off this article by stating that there is no such thing as a perfect RPG system. So many people seek out and actively try to develop a system that will make everyone happy. The problem with this is that every gaming group is unique, they all of different levels of gaming experience, different Creative Agendas and even different preferences. What one gaming group loves, another will hate. In fact one piece of game design/business advice I was lucky enough to learn early one was to tailor your game/product to a niche. The more you focus on pleasing one specific type of group, the better and more focused experience you can give them. Trying to please everyone ends up pleasing no one. But with so many different creative agendas, and personal preferences, it is nearly impossible to find a game that is exactly what you are looking for. The only way to really get what you want, is to make it yourself, and with regard to tabletop RPGs that is a lot easier than you may think. Unlike Videogames, TRPGs aren’t hard coded, they function through a social contract between a group of players. Because of this, the mechanics become modular, and able to bend to the group’s preferences. If you and your friend’s don’t like a rule or mechanic, toss it out and substitute one that you think is better. That can all be done with a few words exchanged around a table. This flexible nature leads to most gaming tables changing the rules in one form or another. In fact this is such a common practice that it has been labeled “House Rules”. A term I haven’t seen widely used in any other industry other than tabletop gaming. This is because other mediums are to rigid, and require a great deal of skill and technical know-how to modify, if modification is possible at all. For these cases, people have come to accept each product of what it is, critiquing it on how it was released. Surprisingly, I have seen multiple Game Masters slave away, trying to modify the Pathfinder Rules to run a Pokemon themed game. With such a large leap between genres that the presence of the original system will do nothing but hold the game back. What boggles my mind even more is that there are two much better options for the Game Master. First off there are multiple free RPG system online that run pokemon, each with a different style of execution. The other option, and regrettably the more intimidating one, is to make your own system from scratch. It sounds scary and like a lot of work, but in the long run it will end up being a lot easier than trying to Frankenstein the Pathfinder rules into something that resembles pokemon. Overall I see Tabletop RPGs like furniture, if you need a cabinet to finish off your room, buy one. If you are particular about color, or how many shelves the unit has, feel free to make some modifications. If you can’t find a cabinet the fits the room, you can try and make your own. But don’t go buying a table in hopes of McGyvering it into a cabinet. 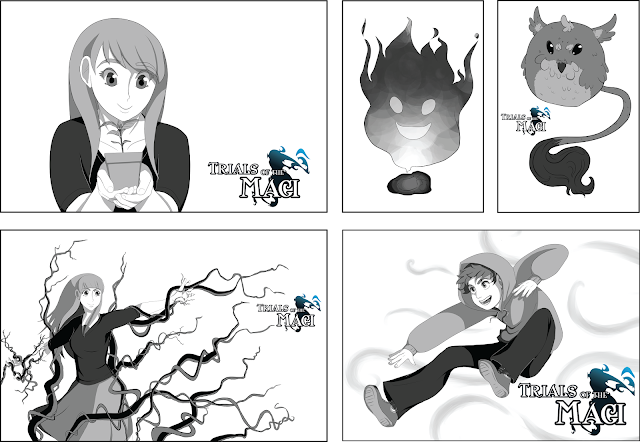 This past week I decided to give myself a quick reprise from working on Trials of the Magi, in hopes that a change of scenery would revitalize my work ethic towards the game. This break took the form of King of Slimes, a quick party game that has players contesting over a bowl of candy; trying to get as much of the hoard to themselves. The motivation for this game first came from reading the rules for another game called “A Week in the Life of a Lv. 1 Slime”. This game had a unique sense of humor, and centered around pulling candy out of a bowl. At it’s core the concept was brilliant but reading through the game fully I found that it’s execution fell flat of my expectations, as the game was a solitaire RPG. Intrigued by having a bowl of candy as the core component of a game, I wanted to explore other ways in which it could be used, and thus King of Slimes was born. This was a really fun project to work on as it allowed me to create a hectic party game as well as push my skills as a developer. But that’s enough backstory on the game, let’s get to the meat of today’s post, what did I learn while making the game. Well for starters, I learned how large of an impact the ability to win has on a player’s mood on the game. One of the major facets of King of Slimes is that when a slime is defeated by an adventurer, it explodes, and reanimates as the largest remaining piece. This means that a player has the potential to be sent back to square one on each of their turns. And in early versions of the game we found that players who exploded late into the game were very miserable until the game ended. They felt as though they had absolutely no chance of winning anymore. Two major changes were made to overcome this, the first was to allow players to keep all of their Vibrancy Candies on defeat. The other was to shorten the length of the game by reducing the number of candies in the bowl. This shortening of game length kept each round fast paced and fun, while not ruining the night of the last place person. Losing isn’t as bad if you can hop right back in and try again. Another thing I found very interesting was that any time the potential existed to help another player, it would lead to the formation of alliances. Alliances that were not enforced by in game mechanics, but by verbal contracts. Or even agreeing to team up and take down the first place person. These agreements added a lot the strategy and flow of each game. This then leads to the final major lesson I learned developing this game. Having mechanics that allow players to sabotage or help each other, leads to a very competitive game. What started out as a simple lighthearted party game, quickly felt like a grand strategy game, when playing with the right players. This isn’t nearly the type of emotional response I thought I would get, but it lead to a fun gaming experience none the less. Overall I am very happy with how King of Slimes turned out and It acted as the perfect break from Trials of the Magi. Why Should an RPG Have an Encumbrance System? One of the major joys unique to tabletop roleplaying games is the act of getting into character and losing oneself in an imagined world. This is such a major aspect of the hobby that simulation has become one of the 3 main pinnacles of RPG design. The innate purpose for an RPG system in terms of simulation is to add structure and consistency to the game that is being played. That being said, rules constructed innately for promoting simulation are often the most tedious and annoying. In most games, the purely simulationist rules are dropped and ignored by players. Things like counting rations, encumbrances, and travel fatigue are all simulation rules that rarely add anything meaningful the Gamist or Narrativist aspects of a game. This got me thinking, if these rules are so commonly dropped and disliked by players, why are they even in the game to start with? After doing a lot of research into simulation games like HarnMaster I think I have good idea of why these seemingly extraneous rules are so important. They firstly act to add a sense of grit and weight to the world being played in. Before reading through some gameplay scripts for HarnMaster, I had never seen players so scared of a wound getting infected, or running out of rations. So immersed in feeling the weight of every choice and action they make. These are all down to earth feelings not normally seen in other games. 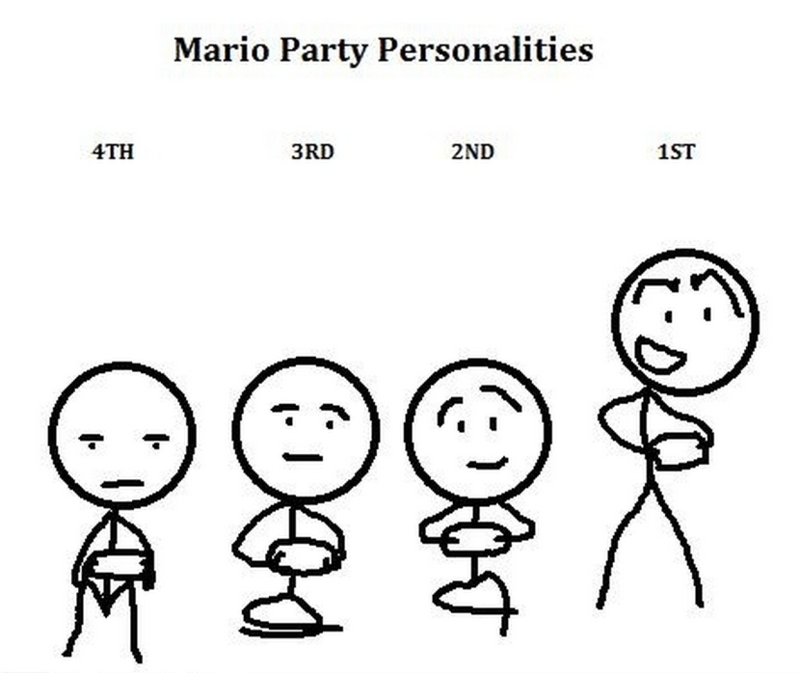 These simulation rules secondarily act as an anchor for new players and Game Masters, giving them a mechanical way to understand the world their characters are in them. If a player jumps down a 30 ft drop with the mentality that they are a game character and fall damage shouldn’t hurt them, they will be in for a rude awakening. Same goes for a player trying to loot everything in sight so they can sell them when they return to town. There are clear in game rules that state how many finally crafted chairs and statuettes the player can carry without being weighed down. And as players begin to understand that real world physics and laws of nature apply to the game world, they are more readily able to connect to the game world. It is much easier to imagine a world when we can use the knowledge of our own world to paint it in. When it comes to being a GM anchor, these rules apply a spelled out, mechanical way to translate commonly understood laws of nature into the game space. Removing the extra work of the game master determining consequences on their own. Most veteran players drop these rules because they no longer need that sort of anchor to understand the world around them. They are able to get a good enough picture of how much their barbarian can lift and won’t try to lift more than that. The other major reason is that the game they are interested in playing isn’t as rooted in simulation, instead focusing more on Gamist or Narativist play. In this case, these extraneous simulationist rules just seem like pointless tedium. However it all depends on what type of game you are playing and the people you are enjoying it with.